I’ve never met a baby who wanted to wear a sock. And yet, we make them all wear two. 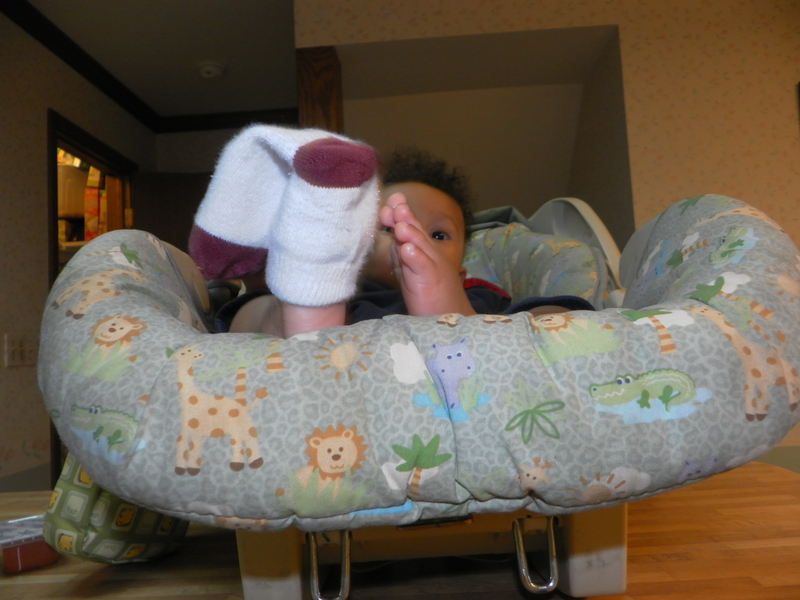 Why babies hate socks is unclear. They seem to be able to come to terms with wearing diapers, shirts, pants, and even some regrettable onesies that they will, no doubt, one day recall as fashion mistakes. It’s almost as if babies know that their toes will never again be so cute as they are during these first months. This is the time to show off those little piggies. Let them go gleefully to market and have their roast beef while they are still pink and round. Whatever the reason, babies like staying in socks like Houdini liked staying in straitjackets. Turn your back for three seconds and the baby will have one sock off and the other hanging by a big toe. This phenomenon is the one, and only, viable rationale for baby shoes. Babies need shoes for no other reason than to shackle their socks to their feet. The liberated toes work to free their imprisoned comrades. It’s amazing how many socks a single baby can shed without ever using his hands. When they grow older, kids seem to like socks a lot more. My preschooler would wear the same pair of socks for days, including to bed, if I let him. I’ve warned him that mushrooms would start to grow between his toes if he didn’t change his socks. Somehow, he thought I’d said marshmallows, which only encouraged him. What better way to enjoy sugary snacks without parental interference than by growing them between your toes? Our baby went the whole summer without anybody bothering him about socks. Now that the weather is turning cool, the battle begins in earnest. I’m glad to see that his sock-escaping skills have not diminished with lack of practice. Every time I turn around, I’m looking for a missing sock. In stores, I have to mentally mark our route so I know all the places to search. I will not admit defeat by buying shoes for somebody who is so far above doing any of his own walking. Baby socks are cheap and easy to replace, but I find myself becoming sentimental about whichever sock our baby has cast to the winds. I don’t want a new sock; I want that sock. If he could lose both socks at the same time, I might be okay with buying a new pair of socks, but I’m not springing for two socks when I only need one. I’ll find that sock, even if I have to search the basket of every shopping cart to do it. I’ll find it, and I’ll put it right back onto that child’s foot. I’ll show that little baby; he can’t break my will to keep his toes warm and dry. I will sock every naked foot I find, until every toe has succumbed to the necessity of being clothed. I will do it just as soon as I get up from my hands and knees and finish searching under the racks in the bakery department. If my little piggies were this handsome, I guess I’d want to show them off to the world at every opportunity too. The comparison almost makes me want to wear two layers of socks. This entry was posted in Baby Trauma and tagged babies, children, family, fatherhood, Houdini, humor, little piggies, parenting, Sock. LOL Thanks for the wonderful laugh this morning, Scott. I really enjoy your blog very much! Off to share. Thanks for being such a loyal reader, Sandy. It’s people like you who keep me going. Because your toes are so cute? I hope it’s not because the doctor found mushrooms (or even marshmallows) sprouting up between them. Best of luck with you dogs, Tom. That’s baby toes for ya! Thanks for stopping by. So very funny and true!!! I can’t tell you how many times I have retraced my steps in the store looking for a sock when my kids were young. Now they dissapear because the puppy confiscates them. lol Great post! There must be a baby-puppy black market for socks out there somewhere. Too bad we can’t tap into that undergound economy. Thanks for stopping by. You know, I really thought I was the only one who put shoes on my baby to keep the socks on! Laughed so hard, great reading! I really enjoyed your post and your humor. But maybe babies just know that socks are black magic items – how else do they escape the dryer? – and they want to avoid such bewitching accessories. And yet they have nothing against diapers. I’ll take the black magic socks, thank you.